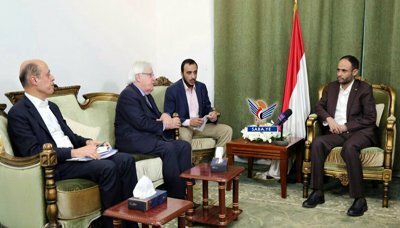 President of the Supreme Political Council Mahdi al-Mashat on Monday welcomed efforts exerted by Special Envoy of the UN Secretary-General to Yemen, Martin Griffith, demanding the lifting of the siege imposed on Yemen. During his meeting with the UN envoy, the president stressed that any papers presented at the negotiating table should provide an ending of the foreign intervention in Yemen. The president noted that the UN charters and international laws, which teach about the respect for sovereignty and independence of countries, should contribute to points that facilitate any political process and negotiations in Yemen. “Yemen is with peace if there is a serious intention from the other parties,” the president said. He affirmed that Yemen has never been a source of threat to other countries, and the hostile states on Yemen are the source of evil. He pointed out that the Saudi-led coalition states are not serious in ending the Saudi-led war after assassinating the president Saleh al-Sammad, the recent military escalation in the west coast, and the direct intervention of the Americans and British in the battle. The president called on the United Nations to play its role in order to alleviate the humanitarian catastrophe caused by the Saudi American war, lift the blockade on Sana’a Airport and all Yemeni ports and stop the war. The meeting discussed the working paper the UN envoy will submit to the UN Security Council on 19 June. In the meeting, Griffith reviewed his efforts during the last period and his multi-communication with all parties.